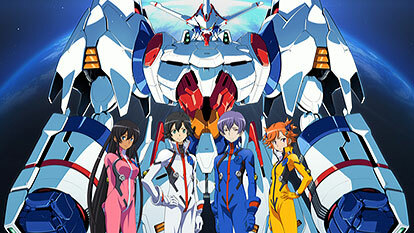 An original mecha anime by the team that made Star Driver. One night right before summer vacation, Daichi Manatsu, a second-year in high school, sees a weird round rainbow floating in the sky above Seed Island (Shuushi/Tane Island) and ventures there alone. He has seen this rainbow before. With the memories of his father's mysterious death and an encounter of a mysterious boy and girl, Daiji arrives on the island while the alarm of a building labeled "Earth Engine" is going off. Someone asks him "Are you a captain?" just as robotic intruders from Uranus called "Kiltgang" arrive. The battle around the shining stars is about to begin.